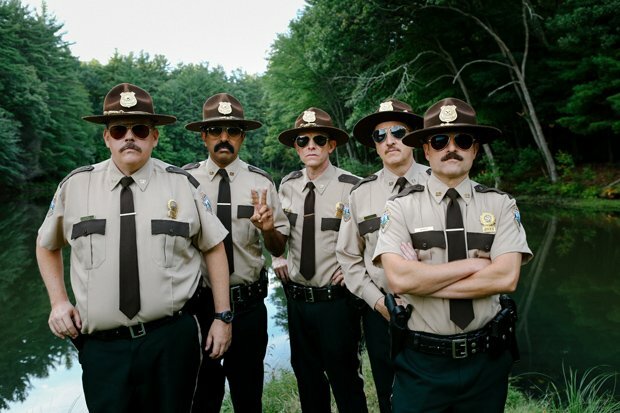 Arriving long after the 2001 original, Super Troopers 2 offers a strong advert for crowdfunding; a studio might see no obvious reason to revive the property, but fans of Jay Chandrasekhar's stoner comedy clearly did. Willing to fork out not only the $4.7 million required to help get it made, they also turned out in droves to secure a healthy US box office haul. Rehashing the same fast and loose structure of the first film through a few plot contrivances, it sees a cartographic error mislay the border between America and Canada. The original band of troopers, recently stripped of their authority as cops, are given the task of patrolling the disputed area. Under the command of their hard-drinking captain (a returning Brian Cox, showing his versatility by segueing successfully into slapstick following his recent turn as Churchill), the troopers aim to best the local Mounties by cracking a drug-smuggling operation, but the plot is just pretext for an anything-goes assembly of sometimes stale, sometimes amusing gags. As with the original, actor-director Chandrasekhar and his Broken Lizard troupe deserve some credit for doubling-down on the specifically Canadian flavour of the setting. Cameos from Rob Lowe and Lynda Carter suggest everyone is firmly in on the joke and, even if the film regularly crosses the line between discussing and enforcing stereotypes, it's arguably too silly to offend. Despite the advancing years of the cast, Super Troopers 2 successfully captures the adolescent tone of its predecessor. Audiences excited by the comic possibilities of a bear pursuing a trooper into a chemical toilet will get exactly what they want, and more, from this lightweight, decidedly low-brow sequel. General release from Fri 15 Jun. The troopers from the original film are given the task of patrolling a disputed border between the USA and Canada. Actor-director Chandrasekhar and his troupe double down on the Canadian flavour of the setting and those who enjoyed the shamelessly low-brow original will get what they want, and more, from the sequel.